Also known as Cosmetic Acupuncture, Facial Rejuvenation acupuncture is a virtually painless, non-surgical method of reducing the signs of the aging process. The technique uses acupuncture and Oriental herbal medicine to erase years off of the face. Based on the principles of Oriental Medicine, it helps you to look and feel younger by addressing the physical, mental and emotional patterns that cause disease and contribute to the aging process: fine lines, deep wrinkles, dark circles or puffiness under your eyes, and sagging skin. Facial Rejuvenation reduces or eliminates fine lines, wrinkles, puffiness, sagging and discoloration of the face while simultaneously supporting overall health. Fine lines may be eliminated and deeper wrinkles reduced. Bags under the eyes can be diminished; drooping eyelids, brow lines, sagging jowls and double chins lifted. It helps to eliminate puffiness by eliminating excess fluids and improving metabolism. Treatments tighten pores, improve muscle tone and dermal contraction, increase collagen production and affect its distribution. Moisture in the skin and evenness of skin color will be balanced by increasing local circulation of blood and lymph to the face. Any stress that is evident in the face will be reduced. 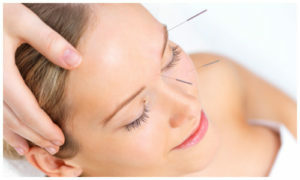 Most importantly, Facial Rejuvenation acupuncture brings out your innate beauty and radiance. Though Facial Rejuvenation acupuncture can sometimes be referred to as an “Acupuncture Facelift,” it is more than just a cosmetic procedure. Ten sessions are recommended for the best result. Yes! The International Journal of Clinical Acupuncture reported in a recent study of 300 people, 270 perceived a marked decrease of facial wrinkles after the treatment. Their skin felt firmer to the touch and elasticity was improved. 90% saw visible results after the facial acupuncture treatments. Our experience suggests similar results with patients reporting improvement in the appearance of wrinkles, complexion and overall rejuvenation. Ten treatments are recommended – once or twice every week. Most patients observe visible results around the 5th treatment, but the full 10 sessions are recommended for best results. Monthly follow-up visits are suggested to maintain results. In addition, Herbs, nutritional supplements, diet and lifestyle counseling may be recommended. Do You Want to Look Younger and Feel Healthier? For more information about acupuncture in Connecticut for Facial Rejuvenation and if it right for you, please call us at (860) 502-9462 to schedule a consultation. You will be treated with compassion, care and dedication.